I run maven compile to make sure the jar is downloaded to my local M2 repo. I use provided scope because I'm deploying to GlassFish. 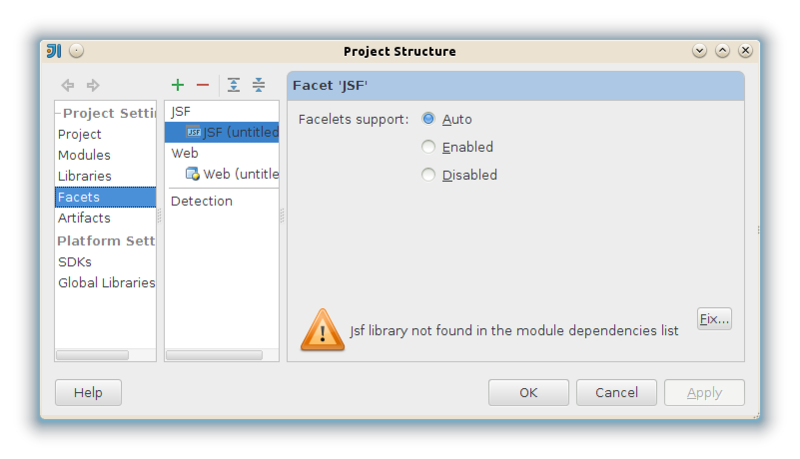 My question is this, if I go into Project Structure > Facets > JSF, there is a warning at the bottom of the window "Jsf library not found in the module dependencies list." If I click "Fix", my only real option is to download javax.faces-2.2.1.jar to my project's lib folder. I don't want to do that because I'm letting Maven handle my dependencies. So basically I'm just wondering if it is okay to ignore that warning? If not, what am I overlooking? I do see that JSF development seems to work just fine. I can write backing beans, XHTML pages to interact with them, etc. and everything seems to work just fine. I'm just concerned about that lib warning on the facets page (screenshot attached).